Klipsch, a leading global speaker and headphone manufacturer, announces today a strategic partnership with Indianapolis-based rock band Hero Jr. The collaboration furthers the company’s commitment to the live music experience and sets a precedent for its support of emerging artists. As a partner, the Klipsch brand will be present at Hero Jr.’s performances and appearances. The band’s music will also be utilized in video and collateral that supports future product releases. Additionally, Klipsch.com will be one of the exclusive sites where fans can pay what they want for a download of Hero Jr.’s fourth studio album, “Mixed Race Indiana Marriage”, due out November 11. Hero Jr.'s seemingly effortless fusion of timeliness and timelessness needs to be experienced live to be fully understood. The four-piece hailing from Indianapolis, Indiana are rehearsed, road tested and ready to shake things up. These boys put on a live show so dynamic and disarmingly reckless that if you take your eyes off the stage for just one second, you run the risk of missing something extraordinary. Klipsch is no stranger to supporting live music. Today, Klipsch is involved in the sponsorship of Live Nation Entertainment concert venues. Additionally, the brand also served as the title sponsor of Kings of Leon’s 2014 Mechanical Bull Tour presented by Klipsch Audio. To purchase Hero Jr.’s new album, visit klipsch.com/herojr. For more information on Hero Jr., visit herojr.bandcamp.com. 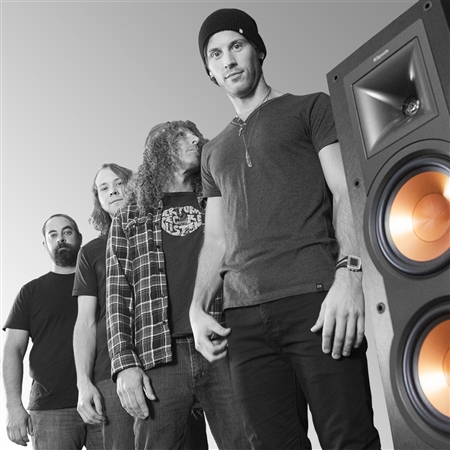 For more information on the Klipsch brand and its products, visit klipsch.com. It takes a special breed of band to set up a few microphones in the living room, hit record, and knock out an album twelve hours later – but that’s exactly what Hero Jr. did and “Mixed Race Indiana Marriage” is the result. Like all of their previous records, “MRIM” boasts track after track of unabashedly authentic, physically compelling rock 'n roll that could have easily existed at any point throughout the past 40 years in terms of their raw sound and palpable attitude. Hero Jr. has spent the last two years touring the country with over 200 shows a year at clubs, festivals and supporting the likes of Tom Petty, Offspring and Saliva. The band is in their element when they are on stage performing where no two adventures are the same. Hero Jr. continues to combine the tradition of hard-hitting, Midwestern rock with a slice of 90s Britpop and have been described as comfortably familiar yet completely unique. Hero Jr. is most definitely a band to keep your eye on.